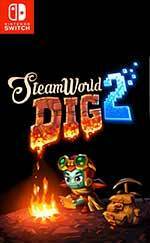 Grab your pickaxe and dig into the sequel to the award-winning SteamWorld Dig! A platform mining adventure forged in Metroidvania flames. In search of her lost friend, a lone steambot and her unlikely companion must dig deep, gain riches and explore an underworld riddled with danger. But time is running short. Once again Image & Form continue to pour heart, soul and quality into their games. Steamworld Dig 2 is another near perfect entry in the Steamworld universe, and the enhanced art design makes me wish that they go back to both the original Dig and Heist and update them and release them on the Switch. I would be the first in line to buy them again. I don’t want to get too much into unlockables and narrative because the story is short and I really think you should discover it for yourself. I also want this review to minimize spoilers because you can easily complete the game in a weekend. For $20, Steamworld Dig 2 packs an immense amount of value and fun into a refreshing platformer with an interesting narrative, lots of explosions, and the satisfying feeling of exploration and constant progression. Really, what more could you want from something that costs less than a real-life pickaxe? SteamWorld Dig 2 is impeccably paced, with new powers and options opening up just when you were getting comfortable with your current loadout. The world is fun to move around, the characters are charming, and the process of gradually increasing your efficiency is airtight. Even with some lackluster combat, more intuitive controls and focus on mobility make it even better than the original. 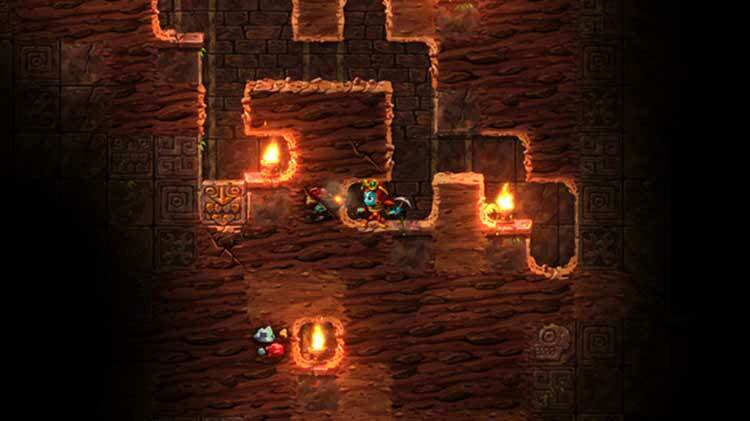 For a series all about digging down, SteamWorld Dig 2 is a clear step up. SteamWorld Dig 2 hits the mother lode with refined, addicting gameplay. Every advancement Dig 2 makes to its story and mechanics strengthens your initiative to progress. There's an overwhelming sense of momentum that runs through the adventure; as if developer Image & Form sifted the original in a pan, removing its redundancies while expanding upon what made it so fun to persistently play. Four years have passed between the first and second SteamWorld Dig, and I can tell the studio has learned a lot of lessons in that time. If the group had simply stuck with the formula from the first game, they would have seen some success, but not a game to this level. Likewise, if SWD2 had stuck more closely with the standard Metroid formula, it may have been written off as just another homage to the beloved Nintendo franchise. SteamWorld Dig isn’t without its flaws. 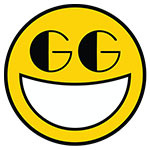 The story never really grabbed me, and the game bestows so many abilities upon you that occasionally you’ll forget about a key skill; I spent a good few minutes scratching my head until I remembered that, two hours or so ago, I’d acquired the ability to steam-jump. And on the subject of controls, Nintendo Switch’s bisected controller is unlikely to cause you any problems; the game is as equally easy to play using a pair of Joy-Cons as it is with the more traditional pro controller. SteamWorld Dig 2 is a game that — much like the original — has no issue reveling in its simple yet undeniable gameplay loop. Fans who expect much of the same will be surprised by the polish and excellence that a hand-crafted world, power ups, and more dynamic art bring to the table. Even with the audience-limiting post-game content, this should be considered a must-have this Fall for PC and PlayStation platforms, and especially for Nintendo Switch owners. SteamWorld Dig 2 retains the core gameplay loop of digging for riches, but layers in stronger RPG elements. Any complaint about difficulty spikes is outweighed by the sheer brilliance of the rest of the game, however. SteamWorld Dig 2 takes everything fans loved about the original game and turns the dial up to eleven. It’s bigger, better, and even more addicting than its predecessor, and absolutely deserves a spot in every single Switch owner’s library. 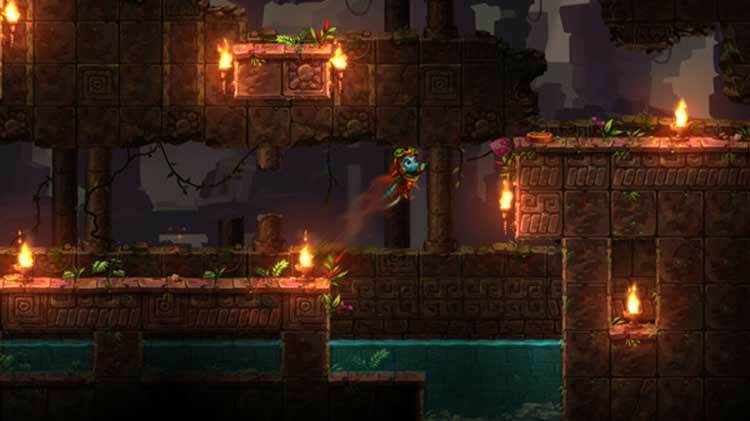 SteamWorld Dig 2 is no mere sequel by numbers, instead taking everything that was loved (and critiqued) about the original and building upon it considerably in every way possible. The sense of exploration is phenomenal, and those willing to dig deep will find the world down in the mines has so much to offer that a good 10-15 hours can easily be spent uncovering all of the secrets before even bothering to finish the main story. This almost out-Metroids Nintendo's venerable series - that is how good Image & Form's latest adventure is. For fans of SteamWorld Dig we suspect the recommendation isn't needed as they'll buy this anyway. For those that skipped the first game, however, Dig 2 is a must-have - its charming aesthetic and cast set the scene for a tightly designed and clever exploration game. 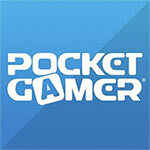 Now the wait begins for SteamWorld Dig 3. Steamworld Dig 2 is a wonderful addition to the Nintendo 3DS library, especially as the heavy focus of Nintendo's future focuses on the Switch handheld-console hybrid. Dorothy's adventure improves on everything that the first game had established, by refining that addictive gameplay loop of dig, collect, and upgrade. SteamWorld Dig 2 is a well-designed, addictive, and fun platform adventure which fans, both new and old, will love. 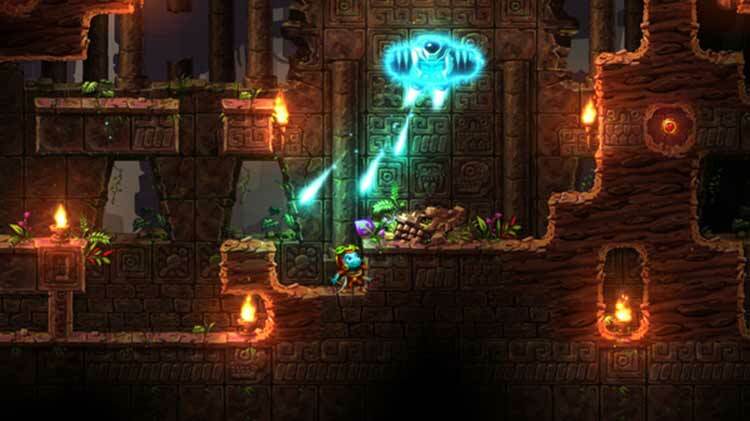 Dig 2 isn't just another SteamWorld game, but the best one in the series so far. 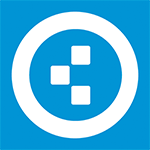 It blows the original out of the water with such ease that it seems almost simple. The biggest improvement isn't that its more Metroidvania-esque, but that Image & Form succeeded in building a world. After four SteamWorld games, everything seems to hit its stride and falls into place on a grander scale. In summary, SteamWorld Dig 2 is a stellar addition to the Switch, and it’s a great throwback to the classic 2D platformers and side-scrollers of yesteryear. There’s more to the game than just the main story mode, and going off the beaten track to discover side quests, relics and other secrets is very rewarding. Quizá algunos duden de comprarlo en caso de no haber jugado la primera parte, la buena noticia es que, aunque sí hay conexión entre ambas entregas, esta parte es muy disfrutable incluso sin conocer la aventura de Rusty. Definitivamente la combinación de excavar y explorar ha sido perfeccionada y no dudo en recomendarles este entretenido metroidvania. Sí que lo vale. Steamworld Dig 2 entra de lleno en el Panteón de juegos indie para Nintendo Switch. Un juego que basa su planteamiento en unos fundamentos a los que no renuncia en ningún momento. Aquí se viene a explorar, cavar, recoger recursos para mejorar nuestras habilidades y a buscar a Rusty mientras nos perdemos entre kilómetros y kilómetros de minas. Acción, exploración, plataformas, enfoque 'metroidvania' y un apartado visual precioso convierten a SteamWorld Dig 2 en una secuela que mejora en todo al juego original de Image & Form, y en uno de los mejores juegos indie disponibles actualmente para Nintendo Switch. Als Serien-Neuling hatte ich bereits einen gemütliches Action-Adventure unter Tage erwartet - aber dass Steamworld Dig 2 derart gut wird, hätte ich nicht gedacht! Vom charmanten Figurendesign über toll designte Rätsel bis hin zu den motivierend eingebundenen Upgrades wirkt hier alles unheimlich geschliffen, so dass dem entspannenden Graben, Rätseln und Kämpfen nichts im Wege steht. SteamWorld Dig 2 est un jeu que l'on a toujours envie de creuser, même s'il manquera toujours un peu de profondeur pour les adeptes de remue-méninges et de défis corsés. Une valeur sûre si vous n'avez pas fait le premier, un petit plaisir supplémentaire si vous l'avez aimé et terminé. Creuser à en émousser sa pioche et se perdre dans un dédale de galeries souterraines n’a jamais été aussi plaisant. 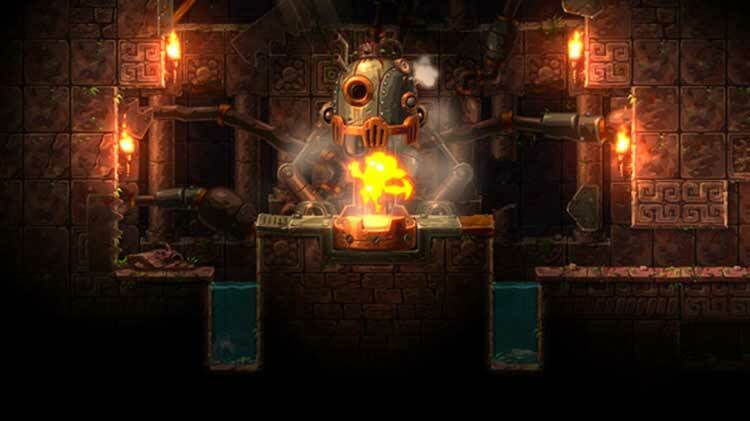 Digne héritier d’un premier épisode qui avait enchanté la presse et le public, SteamWorld Dig 2 se permet le luxe de corriger partiellement les errements de son aîné. Le titre d’Image & Form est un petit bijou visuel profitant d’une direction artistique 2D hors norme et d’une ambiance de fin du monde envoûtante. Ce jeu d’aventure souffre tout de même d’une certaine répétitivité et d’un unique combat de boss. Et pourtant... la magie de cet univers Steampunk décalé opère une fois encore à la lueur d’une lampe à gaz. 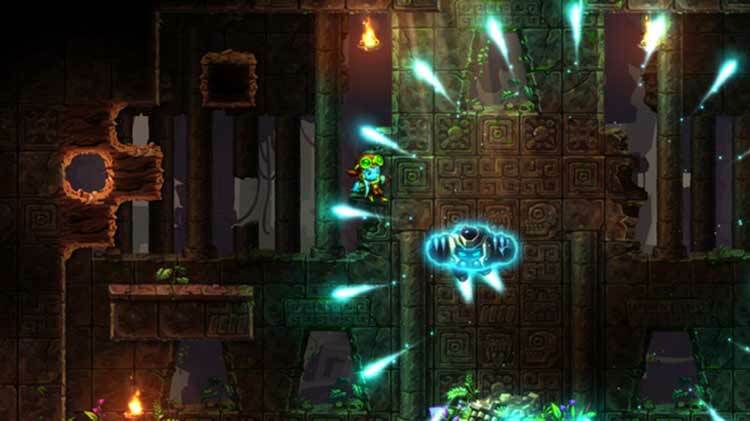 SteamWorld Dig 2 é tudo o que se pode pedir de uma sequela. Capta na perfeição a essência viciante do primeiro título mas ao mesmo tempo transforma-a em algo mais. É um jogo mais interessante, mais divertido e mais viciante. No fundo, é um jogo obrigatório para amantes do género. Steamworld Dig 2 è un seguito che dimostra come l'exploit del primo capitolo non sia stato un semplice caso o un colpo di fortuna. Image & Form conferma invece di possedere qualità indiscutibili confezionando un gioco brillante, equilibrato e divertente, capace di garantire un senso di gratificazione costante e mantenendo sempre un livello di sfida praticamente perfetto. Benché su Switch trovi forse la sua collocazione ideale, Steamworld Dig 2 è un'avventura che merita di essere acquistata su qualsiasi piattaforma si preferisca. Steamworld Dig 2 poggia sulle solide basi che hanno decretato il successo del suo predecessore, ma evolve ed affina la formula introducendo livelli finemente architettati, un più ampio ventaglio di scelte e offrendo, conseguentemente, un'esperienza di gioco assai più personale e calibrata.